Join other animals lovers for a PAINT PARTY at Theodore’s in Canastota! Sunday, May 6th. $40 ticket includes all materials, guided instruction, stencil and * FIRST DRINK. (Additional food and beverages will be available for purchase.) A portion of proceeds will go to Wanderers’ Rest Humane Association! And we will collection donations there as well. Don’t miss out on the fun! 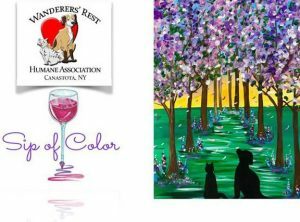 Reserve your seat now: Call (315) 800-9194 or go to: www.sipofcolor.com *All are welcome to paint, must be 21 to drink.